and my vision was cleared by his light. I've been to the mountain with Jesus. I went there to meet him alone. his voice up ahead leading on. he’d have all the answers I need. when Jesus met me at the peak. a trip he required of me. a way that I never had been. to find my way back to his grace. when broken I fell to my face. I’ve been to the mountain with Jesus. He carried me there on his wings. as never before I had seen. his praises I started to sing. I worshipped my Saviour and King! Some mountain top experiences have occurred when I’ve gone to a quiet place alone to seek the Lord’s guidance. Some have been when he’s had to bring me through a trial to draw me back to himself, and other times, he’s allowed me to see him in all of his glory, and worship at his feet. Still others seem to encompass all of those in one amazing trip to the mountains! 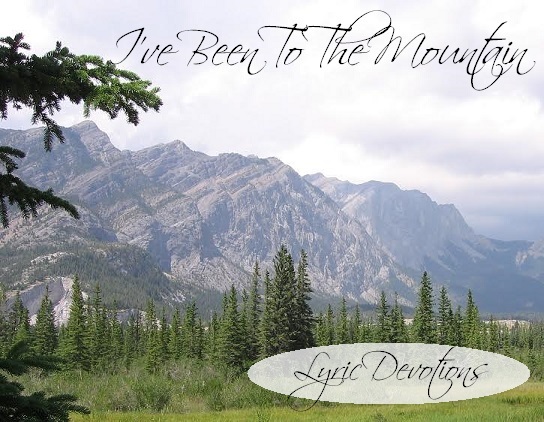 On one particular occasion, the Lord gave me a one of a kind mountain top experience! 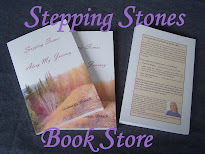 I'd been visiting with a lady who was very enthusiastically talking about her faith and her experiences. She seemed to be so busy doing what she felt the Lord had called her to do. I went home that evening realizing that I had lost that zeal, and feeling like I was doing very little to serve my Lord and Saviour. The previous day, our pastor had preached on the reasons God gives mountain top experiences. Although I saw no mountains on my horizon, I started reading through the notes I had taken during the message, and soon a song began to form. But somewhere in the midst of writing, I felt the need to just be in a quiet place with the Lord. This isn’t easy in a house full of kids, so my only option was the bathroom. I went in and knelt down and began to pray, not really knowing what I was praying about. I just knew my dry heart and spirit needed to hear from my Lord, and soon I was on my face. I truly don’t recall the words I prayed, but the Lord responded to the cry of my heart, and my longing for his touch. Later that day, when Brian came home from work, I said, “Did you know there’s a mountain in our bathroom?” I’m sure he thought I’d lost it, but the mountaintop I experienced as I lay on our bathroom floor was more like a mountain range than one individual peak! 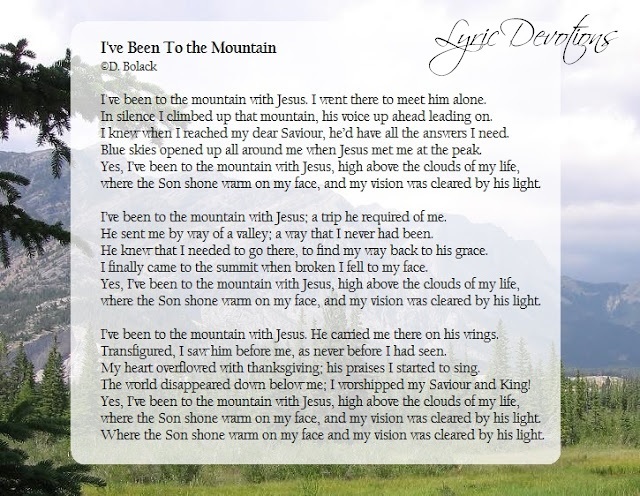 I truly had been to the mountain with Jesus, and the song I wrote that day flowed from my heart as freely as the tears flowing down my cheeks. Soon after this, we had a family reunion, where I was able to spend time with a cousin that I hadn’t seen since we were teenagers. In spite of there being a house full of people, the Lord gave me the opportunity to witness to her for more than an hour. I knew that this never could have happened had I not first met Jesus on that mountain. He knew I needed to go there to find my way back to his grace, before he could ever use me to reach someone else! V.1 Even Jesus went up to the mountain to be alone, to speak with God. When making important decisions and choices, we need to go to a quiet place alone to seek God's wisdom and guidance. This time in prayer and searching can lead to a mountain top experience. Luke 6:12 And it came to pass in those days, that he went up into a mountain to pray, and continued all night in prayer to God. V.2 Abraham had to take a journey to a place God sent him, in order to get to the mountain with Isaac. He went in obedience to God., without questioning. Sometimes the greatest mountaintop experiences come after a trek through a dark valley...a time of trial. Often we don't understand why we are going this way, or why God has asked us to go there. But God knows best...he knows what each of us needs. And when we fully put our trust in him, even though we don't understand how he is going to work things out...when we surrender to God's will, and lay down our Isaac, that is when we find ourselves on the mountain top, seeing things from God's perspective. V.3 Some mountain top experiences come from just spending time with God. When we take time away from the noise and distractions of this world, and set apart time to be with God alone...a true time of personal worship, prayer, praise, and thanksgiving...a time to truly hear his voice and draw nearer to him, we come away with a clearer understanding of who he is...an awesome, and humbling experience! Matthew 17:1,5 And after six days Jesus taketh Peter, James, and John his brother, and bringeth them up into an high mountain apart. While he yet spake, behold, a bright cloud overshadowed them: and behold a voice out of the cloud, which said, This is my beloved Son, in whom I am well pleased. 2 Peter 5:5c,6 for God resisteth the proud, and giveth grace to the humble. Humble yourselves therefore under the mighty hand of God, that he may exalt you in due time. I love this, Deborah! Very encouraging post.